The knocking came at 4:30 a.m. The voice through my motel door said, “Grab your pants and your camera, the champ is running!” The sun was just breaking through the trees when I jumped out of the car and began shooting. 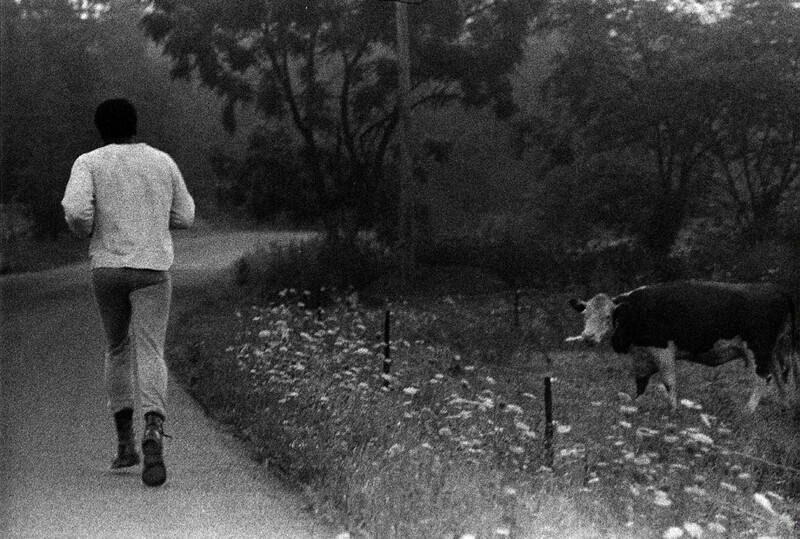 Muhammad Ali was ahead of me jogging along the rural Pennsylvania black top, his breath visible in the early morning cold. A cow in a field of daisies watched as he passed. I was in and out of the car, not up to running five miles before breakfast. Running by a cornfield Ali raised his arms in a victory salute . At the end of the run he jabbed the air and danced in the road, cooling down, I shooting all the while. “Get this,” he said. I raised my camera positioning for a vertical. Ali pulled up his sweatshirt and the rubber liner inside it. As I shot water poured out. “It’s called letting out the sweat,” he said. At that moment I realized that Ali had got me. He understood that I was not interested in him posing and mugging for the camera but in observing the reality of his process of preparation for the comeback heavyweight world championship fight in Africa a month away. The people genius was right. I was writing public affairs documentary films for television when I discovered how much excitement and pleasure photography gave me. Edward R. Murrow had said television was like reporting with a one ton pencil. Now the pencil weighed 33 pounds with camera and sound unattached but in sync. The Living Camera narrationless films Ricky Leacock, D A Pennebaker and a few others were making were devoted to capturing “the feeling of being there”. And that was precisely what I aspired to do with still photography. I was astounded by what I found at Ali’s camp. “If there’s a secret to my fights,” Ali had said, “it’s how I prepare,” . The place had an air of artistry and imagination: log cabins, magic tricks, huge power stones bearing the names of boxing greats, poetry and humor. In the next two days I went everywhere with Ali – an old people’s home, an exhibition match, watching him practicing the “Rope-a-Dope”, taking tea and talking poetry with a visitor. I shot 33 rolls in the two days. Ali said nobody had ever taken so many pictures of him. 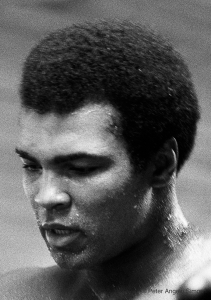 In 1974 Muhammad Ali was thirty-two years old. He was notoriously fast on his feet and quick with his tongue. Today to simply speak or move is a challenge. A world of well wishers still cherishes his spirit and is inspired by his extraordinary life.